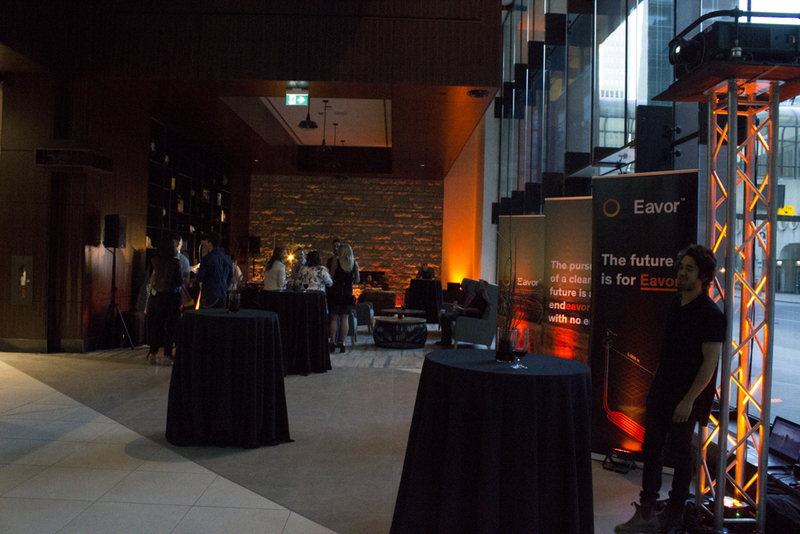 We were honoured to have helped Eavor promote their rebranding on Monday night at The Edison downtown, as we set the scene in the gala through the client’s request of discrete but impactful AV services. 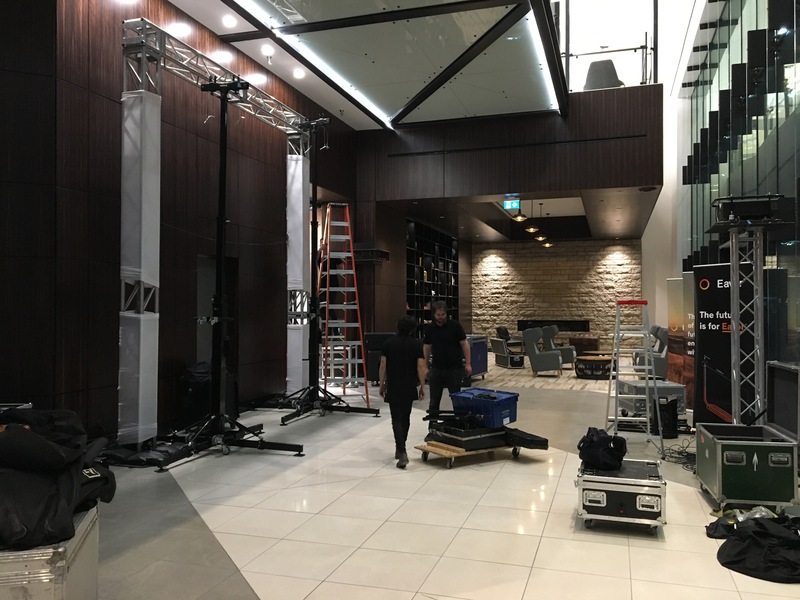 We popped into The Edison outside of normal working hours, and as a crew, did our best to delicately install the 16’ high truss section in-doors on ceramic tile. 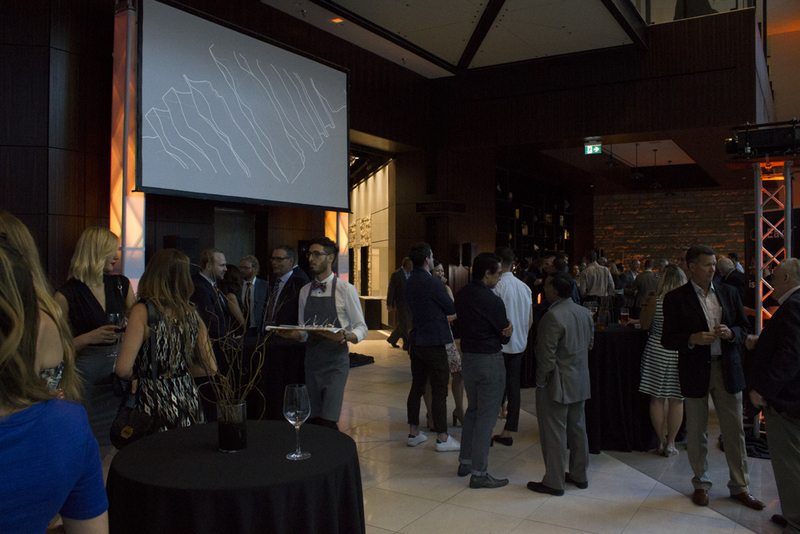 This event called for a south-facing 13’x7.5’ projector screen, so we had to use a very bright 12,000 lumen projector to ensure the projection was visible from across the room. We also needed to keep the flow of traffic open while not interrupting the transmission, all in tight but high corridors, so we set all of the projection elements on trusses, on a fragile floor. The truss itself stood 16 feet high, and 12 feet across. Everyone from our crew had to put a hand-in on elevating the equipment safely, but we pulled it off smoothly through team communication. 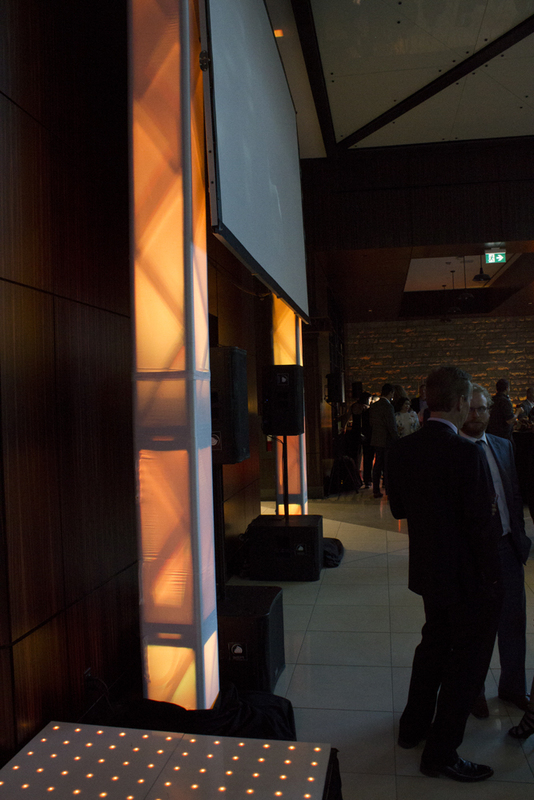 We set the uplighting to match the corporate branding of the Eavor orange tone. The uniform, multi-level par-can uplighting was a soft and appropriate blend for the truss skirts, and we covered the in-house lighting with gaff tape to ensure the par-can uplighting came in bright. 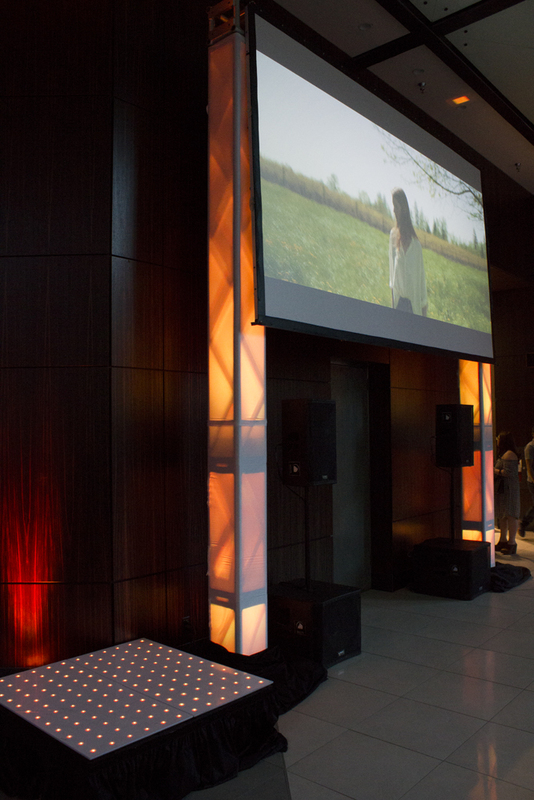 We also ran four LED bars to a light mixer, and worked the lights to match the already pre-set orange. The light bars were away from the general crowd, and we hid a few cables behind the DJ. We ran the subwoofers and speakers in stereo, placing the speakers on sticks on subs, and locating them discreetly within the truss sections. 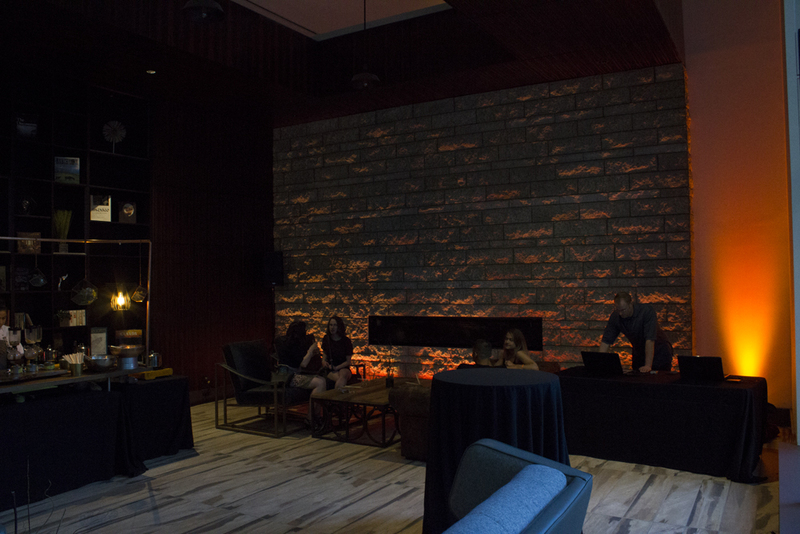 We also provided a few satellite speakers on either side of the get-together, filling the whole space on the main floor and keeping the volume at a comfortable enough level for people to mingle. 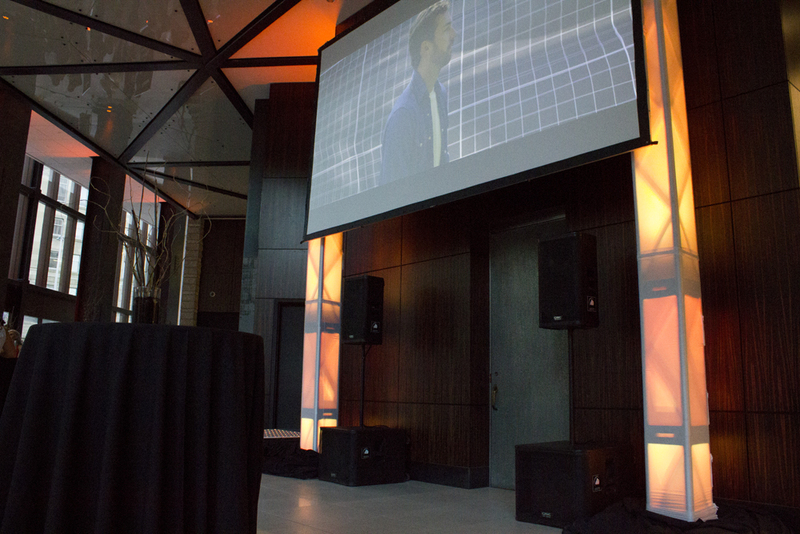 Also, recognizing the professionalism at the event, and that time was on our hands, we were able to covertly hide the cables, or even employ stealth audio systems to run some speakers with minimal cable. We ran some cables in-between the truss, along the truss-arch between the truss and behind the projector screen, and through cracks in the walls, all in the best effort to remain discrete, and keep any cable out of the general walking path. The music was provided by Revolution Entertainment, which kept the people bumpin’ and socializing without concern.